*First published via email on Thursday, February 28, 2019. Click here to subscribe. It's been a little while since I've done a sitting-still kind of meditation. This morning, I was feeling a little too swirly to sit down and write yet (I write best when I'm feeling emotional but grounded at the same time), so I wanted to sit and meditate first. There are so many different meditations out there, and I have a couple of go-to ones, which you can check out on my YouTube here. But this morning, I wanted something a little different. I've been reading a book by Kathleen Hanagan (who will be featured on the show in a few weeks, yay!!) called, "Loveseed: The Template for Birthing a New World," and her book comes with some guided meditations. During this loveseed meditation, I was guided to envision my loveseed, which I equate to my core self. It's a seed because we have to water it, nurture it, and love it in order for it to grow. It's the part of us that we bury down deep beneath layers of protection mechanisms. As I envisioned my loveseed, I saw a clear picture of a droplet of water with soft yellow, purple, and pink light surrounding it. It lives in my solar plexus, that spot underneath my ribs. As I imagined watering this seed, I felt the swirliness in my head and chest begin to melt away. After the meditation, because I love to look up what the possible meanings are of the things I see, I looked up what the water droplet symbolized. And when I look these things up, I'm just being open to receiving whatever feels like it resonates. In my opinion, there's never a right or wrong interpretation. And it's not about taking everything you see and read as the absolute truth. When you open yourself up to possibility and get curious, magic can happen. What popped out at me from the few sites I checked out was that water symbolizes flow, it's reminding me to dive deep beneath the surface of my emotions, and to remain flexible. And of course, because I was able to be open and curious, I was able to feel inspired by all of this and share it with you all (instead of forcing myself to sit down and bang something out on the computer to you guys just because time is ticking). 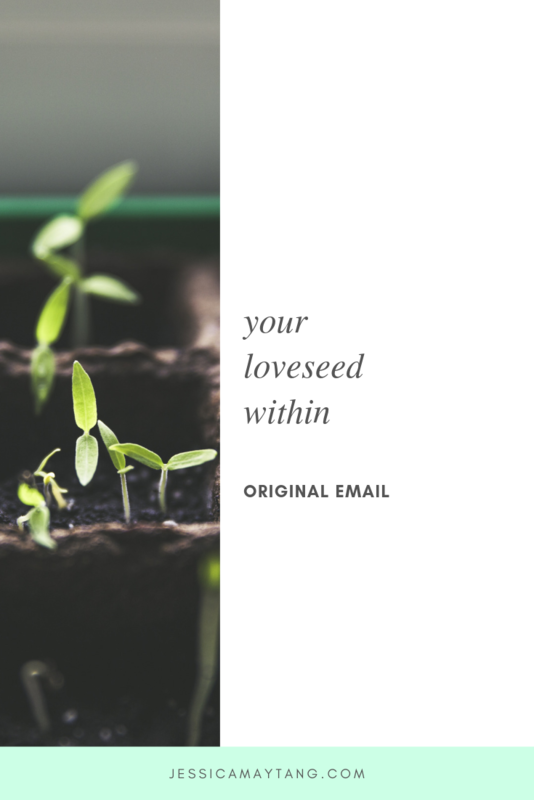 I'd love to hear from you now - If you imagined your loveseed, your core self, what does it look like and where does it live in your body? HOW do I turn my grand vision into reality?